Seven months ago, I made part of my Zecco account a “play account” with a small amount of play money in it. For most of the stocks I purchased, I have hold them for quite a long time and have gone through the ups and downs through out the years. I am still planing to hold on those stocks for as long as I can foresee, though maybe not forever. On the other hand, the reason for having a play account is to make some quick money, hopefully, from quick turnovers. Even if some purchases don’t turn out as I would hope for, the losses are limited because the size of the play money. When I started to use the account to make speculative purchases back in February, I had $228 in it. Later I added an additional $700 from dividends and referral bonuses. And the reason for me use Zecco, not any other brokerage accounts, for this activity is quite simple: I can use 10 free trades per month offered by Zecco. If I only trade a few hundred dollars every time and trade a high frequency, it don’t make too much sense to pay $7 (Socttrade) or $4.95 (TradeKing) on commission. 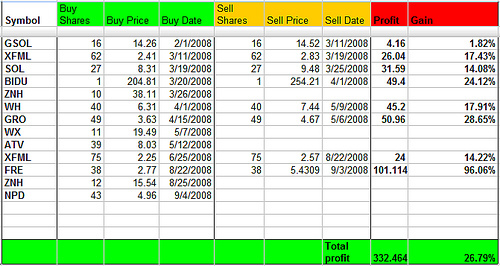 Anyway, I have made some trades since then and made a few bucks. I’d love to do a little more, or at least use up the 10 free trades I have at Zecco. Unfortunately, my full-time job just doesn’t allow me to do so. I can only trade when I can, at the price I want. Also, I want to do a little more than just buying stocks at market prices with this account, but didn’t have the time to do that yet. Since this is a play account, I didn’t spend any time on researching the stocks before I traded them. Most of the time, I just went to my monthly Chinese ADRs update and picked those that dropped the most. I want to spend the least time on this with minimum effort. Do you have a play account? *Cough* I have been thinking about switching to Zecco, since last time I used Sharebuilder it was $9.95 to sell my shares. Since I’m not usually investing thousands of dollars at a time, Zecco seems like a good option. I never really thought of having a play account with a small amount of money to try it out. If you only want to buy a small amount at a time, then Zecco makes a better choice because it has no commission.